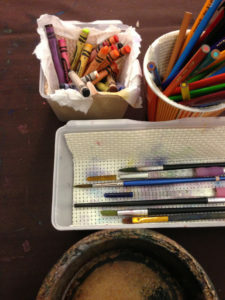 Art tables are areas in the sanctuary set up with art supplies. They are available for personal expression during church services. 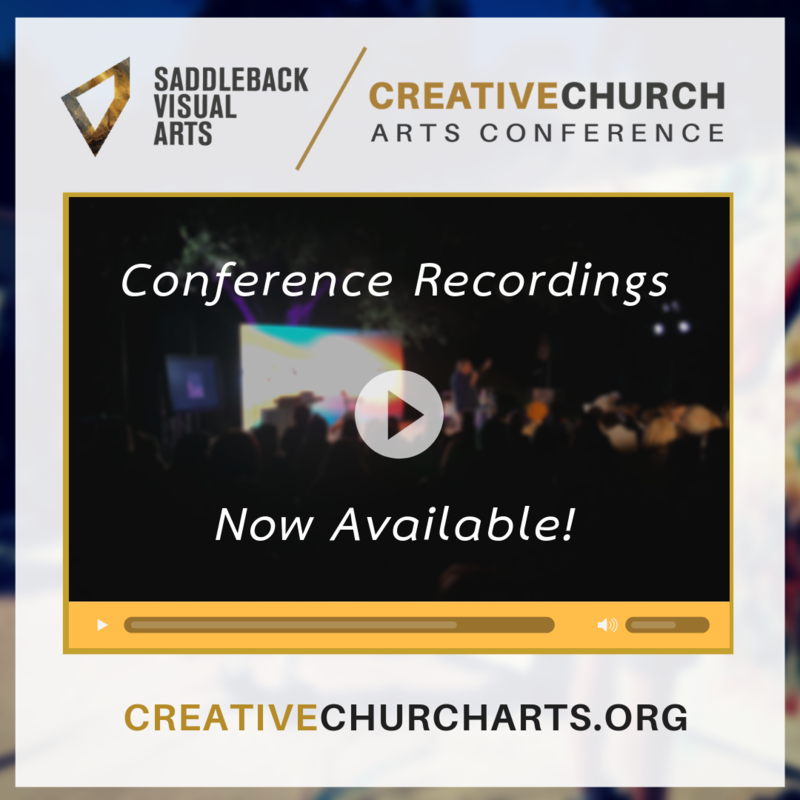 Concept: Create a space in your sanctuary for visual processors to journal and create small, simple artwork as a personal response to God during the Sunday message. 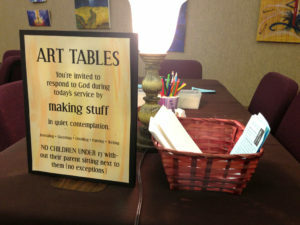 In addition to the standard rows of pews or chairs, a few tables are provided on the side with simple art supplies for anyone to use in the art table area. It’s a quiet area to hear and respond to God through color, line and writing. Background: Art tables began as an experiment when the pastor asked VineArts Boise to create a place in the sanctuary where people could meditate and draw or paint whatever God seemed to be speaking to them during a special New Year’s Eve service. The tables were well received by the congregation and soon became a regular addition to Sunday services. How it works: Occasionally the pastors explain from the pulpit what the art tables are for. Just before every service, a volunteer turns on the table lamps, pours clean water into containers and puts a small stack of watercolor paper on each table. Then the volunteer sits at one of the tables during the service. When the worship music starts, people of different ages, abilities and genders start coming over, and they stay seated at the tables through the whole service. 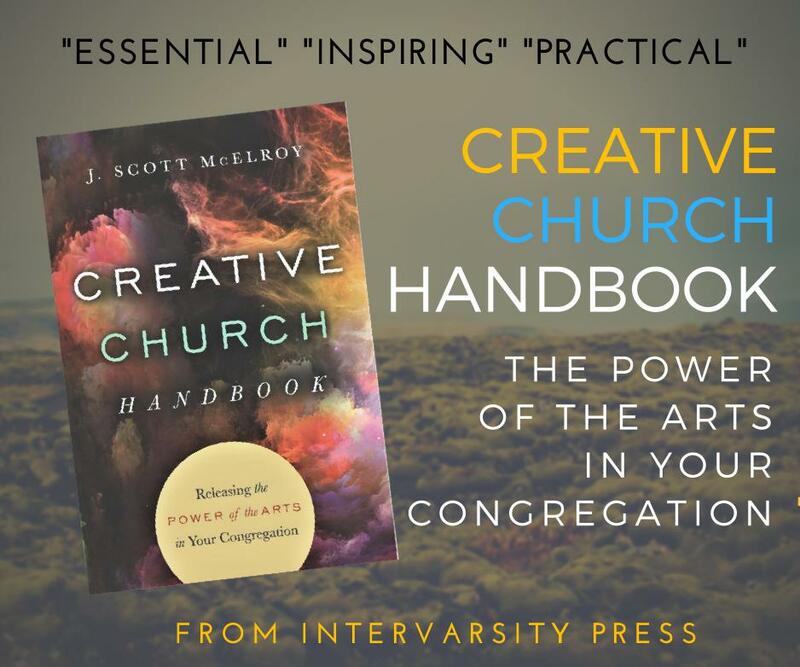 A large church may average a dozen people each service, usually a random cross-section of the congregation: a mix of creatives and regular folks. Most will be adults, with a child or two mixed in. Some artists bring their own pens, pastels, professional markers, or watercolors to worship God or illustrate the sermon in their journals. Jessie Nilo (VineArts director) often draws or paints her sermon notes using her own watercolor kit. Visual processing helps her grasp God’s Word in a deeper way than listening alone. Details: Consider positioning the tables on the side of the sanctuary that’s closest to a water supply. You don’t want the art tables to feel relegated to the back of the sanctuary, nor do you want them to feel too scary or prominent to approach in front. You may want to start by putting drop cloths under the tables and then determine if you really need them later. Cover tables with padded outdoor tablecloths. This will eliminate sounds of things being dropped on tables, which happens a lot. Dampen the sounds of bushes tapping water containers by lining the tops of the containers with foam strips. Cheap, thin paper can make a surprising amount of noise. Stop paper rustling and crinkling sounds by providing nice, thick card stock instead, with a watercolor paper type texture. If you cut the paper into smaller sheets, there is less tendency to fold it (more noise) because it’s so small to begin with. Use cushioned sanctuary chairs around the table to avoid noises made by plastic or metal chairs. Table lamps are necessary if the overhead lights ever dim, but keep water containers a bit separated from the lamps because of electricity. Twisting the lamp’s cord around a table leg a few times will ensure nobody trips over it. Also, tape loose cords onto the floor with acid-free gaffer’s tape for safety. 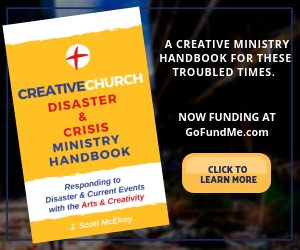 Art tables are not a place to discuss things—not even great things like art or ministry. All of these can wait until after the service. Of course, prayer is the one exception; don’t stop someone from quietly praying with another person when they feel led. Age requirements are necessary for people to process deeply spiritual content. If there are not clear age requirements and the purpose of the art tables is not communicated, it quickly dissolves into a never-ending baby-sitting job. VineArts now keep a stack of fliers on each art table that says: “Parents: Please come over and sit with your child at the art tables.” They give that slip of paper to any child they find sitting by themselves. 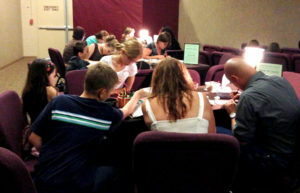 At Vineyard Boise, some people have come to Christ through connecting with God at the art tables. 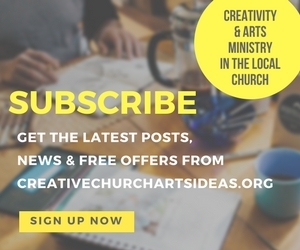 For many others, expressing themselves creatively during the service has opened up a whole new way to relate to and worship God and has brought new life and excitement to their church experience.